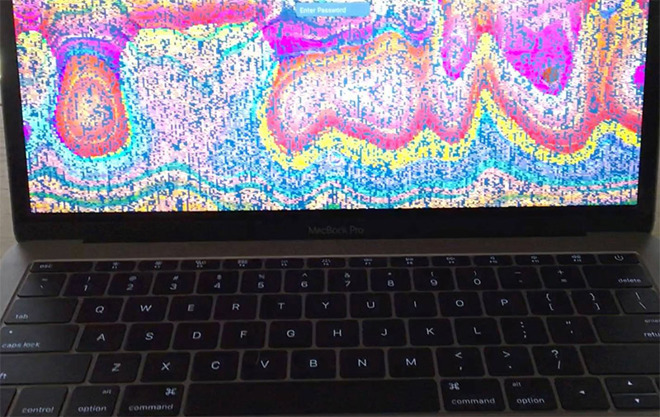 An undetermined number of 2016 MacBook Pro models are suffering from disturbing graphical rendering issues, with owners reporting full screen artifacts, screen tearing, flashing, random "glitches" and even system crashes. The issue, however, is related to overzealous third-party software and is not indicative of a critical hardware flaw. Reports of graphics related issues first surfaced shortly after the new MacBook Pro lineup arrived in customers' hands last month and have only increased in recent days. Apple's Support Communities website, for example, contains multiple posts (1, 2, 3, 4) from concerned owners of both 13- and 15-inch 2016 MacBook Pro variants. Initial reports were unable to pin down a root cause of the errors, but sources familiar with matter informed AppleInsider that overaggressive or otherwise sloppy code distributed in third-party software is to blame. That said, a small number of users report seeing similar problems with Apple's own Photos app. In a serious case chronicled by a MacRumors forum member Jan Becker, a new 15-inch MacBook Pro configured with an optional AMD Radeon Pro 460 GPU encountered trouble and ultimately crashed while transcoding video in Adobe Premiere Pro. Becker consequently took the machine into an Apple store for replacement. The incident did not go unnoticed by Apple. Becker said he received a call from the company's headquarters in Cupertino, Calif., where a team of engineers asked him to help replicate the glitch over the phone and requested access to the affected laptop for further investigation. Circumstantial evidence suggests 15-inch MacBook Pro with Touch Bar models equipped with the Radeon Pro 460 are most impacted by offending software, which makes sense considering Apple's top-end machines are commonly used for computationally intensive video and image editing tasks. Identical reports of graphical maladies are cropping up from owners of 15-inch MacBook Pro models running standard AMD Radeon Pro 450 and AMD Radeon Pro 455 GPUs. Perhaps most telling are similar issues seen in 13-inch MacBook Pro models, both with and without Touch Bar. Since the 13-inch variants rely on a different graphics processing system than their larger siblings, specifically Intel's integrated Iris graphics chips, the problem can likely chalked up to faulty software. Update: Apple has informed us that users experiencing the graphical distortions elsewhere than un-updated software should contact Apple support or make a Genius Bar appointment for case documentation.